Got Sleep Apnea? Sinus troubles? Skin problems? Hemorroids? Cold Sores? Need more Bone Density? They work for me and my family! When sinuses get inflamed by persistent irritation due to pollution, allergens, bacteria, fungus or virus, they can close off. This makes them very difficult to access and your immune system can be overwhelmed by pathogens. It is important to treat at the first sign of sinus inflammation so that Sinus Relief can reach deep into the passages to help attenuate the pathogens. What is all this about fungus?Infected sinuses often have a fungal layer that insulates the bacteria from the nasal membranes. This keeps your immune system from being able to access and kill the bacteria and allows them to grow at alarming rates. The fungal layer also produces exotoxins that irritate and inflame the nasal membranes. In order to deal with this effectively, you need something that kills bacteria and fungus on contact. You need Sinus Relief™. Sinus Relief is a broad spectrum antimicrobial that kills the fungus and bacteria in an even manner so that the over-load can be reduced and a healthy fauna is left. Try the Formula that has been recommendedby ENT specialists! Nature's Rite Sinus Trilogy™ is clinically proven tobe effective treatment for Sinusitis! It Clears Most Sinus Infections in 3 to 5 days,WITHOUT surgery and antibiotics! Are YOU one of 40 million Americans who have regular sinus problems?Have you tried a neti pot or antibiotics, but they didn't help? We have a solution for YOU!From Nature, with LoveComplete Sinus Care...The Sinus Trilogy™ is a complete and all-natural heatlh care system for your nose. The Sinus Trilogy™ products provide all the necessary ingredients to rid yourself of sinus infections, protect your nose from environmental assault, and naturally relieve congestion. 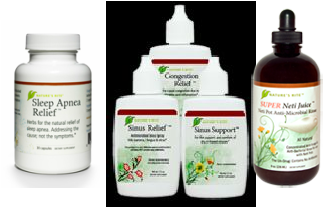 There are three easy steps to ridding yourself of sinus infections and discomfort.Sinus Relief™ - eliminate bacteria, fungus, and reduce inflammation.Sinus Support™ - relax, moisturize, and heal your damaged sinuses.Congestion Relief™ - clear your congestion and relax inflamed membranes. Herbs for natural relief of sleep apnea. Addressing the cause, not the symptoms! Lobelia and Thyme to support deep, steady breathing. The cramp bark and chamomile relax the sleeper and allow an easier transition into sleep. $45.99 Try it now RISK FREE! 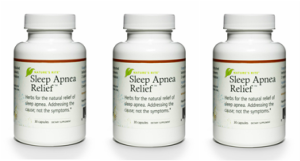 Get your Sleep Apnea Relief at a big discount when you order three.